When Sarai Chandler walked into her new classroom for the first time, she was greeted with empty desks and bare walls. This is the plight faced by many new teachers in Durham Public Schools, where one often must purchase his or her own school supplies. This burden falls particularly hard on new teachers in the district. Crayons2Calculators is a nonprofit working to fix this problem by providing free school supplies to teachers at low-income schools. Teachers can come to the Crayons2Calculators (C2C) warehouse where they are able to “shop” with points. They are given 100 points to spend when they come in. This allows them to choose the specific supplies they need in their own classrooms. The warehouse is lined with baskets of highlighters, pens, pencils, paper and glue – anything a teacher could ask for. “It’s amazing how much little things can add up over the course of a year,” said Hodskinson said. C2C is aware of the extra burden facing new teachers, and gives them extra points to get started. Sarai Chandler is starting her first year in Durham Public Schools (DPS) teaching fifth grade at Bethesda elementary, where 99 percent of children are on free and reduced lunch. Bethesda is not an anomaly. Many of the elementary schools in DPS have over 99 percent of their students on the free and reduced lunch program. Students are expected to bring in their own supplies, but often families cannot afford the expense. This leaves it up to the teachers to cover the bill. DPS faces a high level of poverty compared to the national average. According to statistics on the DPS website, 66.16 percent of students in the district qualify for free and reduced lunch, whereas national statistics show that an average of 48.1 percent of students qualify nationally. This high incidence of poverty, and a lack of funding create a supply issue in the school system. The burden of buying supplies also falls on returning teachers, who must replenish supplies that have been used up over previous years. “I never met a teacher who doesn’t buy hundreds and hundreds of dollars worth of supplies for their own room every year,” said O’Neill. Eunice Sanders, a retired school administrator and the co-executive director at C2C, said that they allow teachers form the poorest schools to come first, to guarantee the help is going to those that need it most. “There are thousands of dollars each year that I put into my classroom,” said Carol Barnes, an art teacher at Watts Elementary. “And without this, it would be more. This is incredible. It is a godsend for us.” Barnes has been teaching in DPS for 45 years, and said she has been faithfully coming to C2C since it opened in 2006. After 10 years of growth, C2C is in the process of moving to a new warehouse at 809 Bacon St. provided by the Durham Public School District. 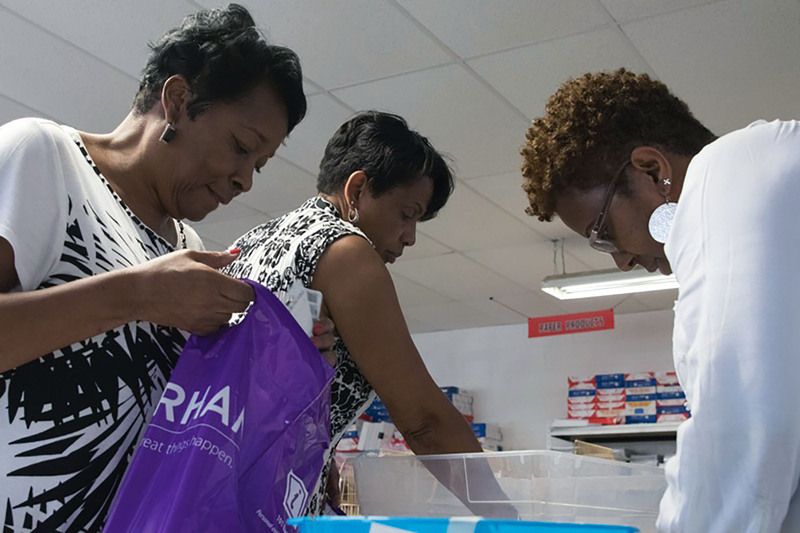 While they are now closed for up to six weeks during the transition, C2C expects to reopen with far more supplies and resources to help teachers. The increased space will allow them to distribute the supplies to a wider audience of teachers. “Teachers deserve better,” Sanders said. While the lack of supplies is an issue for the teachers at DPS, they do not let that get in the way of their teaching. Nile Foxx is a senior photojournalism major at the UNC-CH School of Media and Journalism. An Iowa native, this fall he is serving as photo editor of the VOICE. This entry was posted in Education, Non-profits. Bookmark the permalink.